If you are a frequent traveller to the West­ern Division or to Suva via Queens Road you would often wonder what is behind the corrugated iron gated property on the Coral Coast. Yes, that’s right, we are talking about the vacant land property that was purchased by Guangdong Silkroad Ark Investment (Fiji) Co. Ltd. The Chienese company is supposed to build the Wyndham Silkroad Ark Fiji Hotel near Komave Village. It has been more than two years since the groundbreaking ceremony for the $500 million project on the Coral Coast took place and nothing has eventuated. 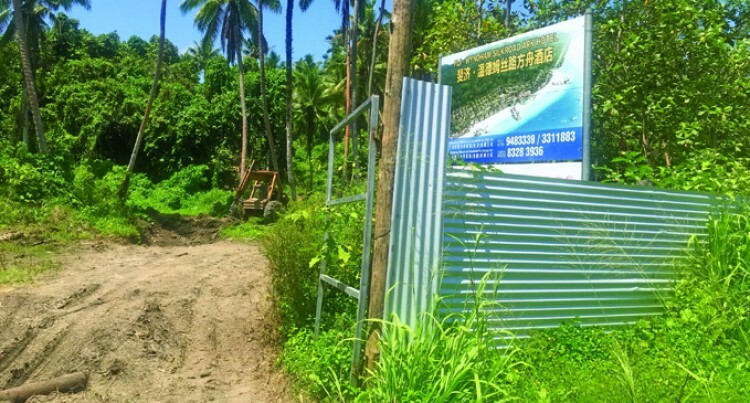 Guangdong Silkroad Ark Investment (Fiji) Co., Ltd general manager Haolin Li, in an ear­lier interview said they were still waiting for the foreshore lease approval from the Minis­try of Lands. After a numerous attempts to get comments from Mr Li, SunBiz was advised that he was in a Australia on a business trip. Mataqali Rogoua of Komave village is the owner of the land leased to the Chinese devel­oper for the Wyndham Silkroad Ark Fiji Hotel project. However, the foreshore and iqoliqoli area belong to Yavusa Vusu which comprises of the three villages of Biausevu, Komave and Namatakula. It is understood that the fore­shore and iqoliqoli lease approvals has not been given by Yavusa Vusu. In an interview, yesterday with Mataqali Rogoua spokesperson Semi Togaviloku said: “We are still waiting for the developers to be­gin works. They told us that they would begin works on the land before the elections. “The last meeting, we had was in October and they had brought in the Environmental Impact Assessment (EIA) team. “The Yavusa gave the approval for the EIA to take place but did not approve the iqoliqoli lease agreement to be given. “We met and had a talanoa session with the Chinese developer which didn’t turn out well because the Yavusa would not agree on the foreshore and iqoliqoli lease agreement, be­cause they do not want any hotel development (such as the overwater bure) to be done over the water. The Minister for Lands and Mineral Re­sources Ashneel Sudhakar in his opening statement in Parliament last week said that no such license or lease for the use of the qoliqoli had been approved by the Ministry of Lands. Mr Sudhakar was responding to SODELPA Member of Parliament Inosi Kuridrani’s statement in parliament over claims of trans­parency, accountability and good governance by the FijiFirst government over land and iqoliqoli issues. Mr Kuridrani highlighted the Surfing Act. “My tribe (Yavusa – Vusu) is the traditional custodian of the iqoliqoli from Namatakula to the Korolevu passage,” Mr Kuridrani said. “Previous governments allowed us to receive compensation for the use of our iqoliqoli and we charge $5 per diver as well as anchorage fees to game fishing boats. Unfortunately, we have been denied this opportunity when this Act came into effect, thus affecting a common means of income for our people. “Secondly, the issue of license to an inves­tor for the use of our I’qoliqoli was approved by the Ministry of Lands without any con­sultation with the Qoliqoli owners. “There was no Environment Impact As­sessment (EIA) conducted, no plans to con­firm the iqoliqoli boundary and no docu­ments to confirm the project plan. “To make matters worse, we have not met the investor despite our repeated requests to have this arranged. “However, when we wrote to the Minister of Lands to raise our concern, the Ministry replied that the investor is willing to give $20,000 for development cost as compensa­tion. Mr Sudhakar responded: “The Honorable Kuridrani’s statement delivered against the Ministry (last Friday in Parliament). had mentioned that the Ministry had issued a license for the use of their iqoliqoli without the landowners’ consultation and consent. “There was no EIA conducted and no plans to confirm the qoliqoli boundary. “I would like to assure this august House that no such license or lease for the use of the qoliqoli had been approved by the Min­istry of Lands. “In fact, work is still in progress. “On the claim of no consultation, in fact there had been numerous done with the Va­nua Vusu on the 12th September, 2016 and on the 27th of July, 2017. “In fact the meeting held on the 27th of July, 2017 at 12pm which was held in the Namatakula Community Hall in Namataku­la Village which is Honourable Kuridrani’s village. The meeting records indicated that Honourable Kuridrani was present in that meeting in his capacity as the advisor of the Yavusa Vusu. “On the EIA Honorable Kuridrani is cor­rect that no EIA has been done, but it is be­cause that the foreshore leasing process is in progress. “For the demarcation of the qoliqoli boundary the work is still in progress. “As to the claim of compensation of $20,000 which in fact is $19,828.25 which is the fish­eries year one compensation figure. “We acknowledge the maiden speech by the learned member but Honourable Kuridrani should do the honourable thing and stop mis­leading this house and in fact he should apolo­gise for his incorrect statement. “Our Government does not rob our landown­ers of their resources like some previous gov­ernments.